First, there were the infamous anti-Muslim cartoons published recently by the Danish magazine, Jyllands-Posten. The cartoons published by that magazine sparked violent protests around the world. What isn't as well known is that Jyllands-Posten is a reactionary, right-wing publication that has, in the past, refused to run similar cartoons involving Jesus. The violence evoked by these cartoons is inexcusable, but the magazine's motive in publishing them is suspect, at best. threatening his life with a t-shirt. So why not now threaten a top political cartoonist for drawing a cartoon that the Pentagon doesn't like?" Coincidentally, right around the same time I had a run-in as a result of one of my own subversive doodles. 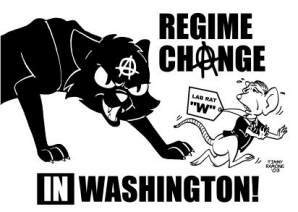 You may recall "Regime Change", a drawing I ran back in ROWRBRAZZLE #77. This drawing has been displayed in several art shows, graced posters, signs, stickers, and was even published in a collection of anti-war art and poetry (Voices of Resistance, Women's Student Activist Collective, 2003). However, it was regarded as "too political" for Yerf (an online archive of "furry" art at http://www.yerf.com) and was deleted -- supposedly because of complaints from other Yerf members (though I think I know who complained about this piece, and I suspect his problem was more personal than political). Of course, everyone knows censoring a cartoonist is the LAST thing you should ever do -- it only encourages them! 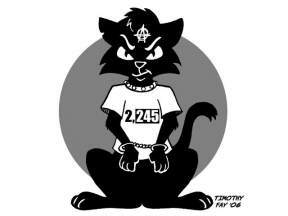 I was determined to respond to this affront, so I created "T-Shirt Trouble", which depicts the "Circle-A Kitty" (as I call the character) wearing a T-Shirt similar to the one that got Cindy Sheehan arrested at Bush's State of the Union address. The reference is a bit obscure, but I figured the right-wing kooks who whined about my "Regime Change" drawing probably aren't smart enough to figure that out. And it looks like I've been right so far. Assuming I don't get arrested for drawing any more "dangerous cartoons," or for singing along to "London Calling" by the Clash (as happened to one unlucky fellow in England recently), I should be back in another 60 days or so. Keep up the good work, `Brazzlers!